These measure about 3 1/2" in length and are made of red (very nicely) pressed rubber. You can specify whether you would like them mounted onto a static cling vinyl backing or left as is to mount yourself. They are pretty cute if you ask me and I should humble myself a little bit more when I say that, because I was the artist that drew them. So, if you would like to win the really cool Cricut cartridge AND this set of angel stamps....coerce all your crafty friends into coming and visiting this blog and joining me. It makes you wonder what I might have up my sleeve after we reach 125 followers....hhhmmmm....? 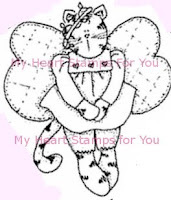 Shelley, those are really stinkin' cute stamps. I didn't realize that you were an artist, that is amazing that you drew those angels. I wish I was artistically inclined to draw, I would have so much fun. I can't wait to find out who won this giveaway! I knew it, I knew it, after watching your video using the copic markers, I knew you werent just the run of the mill crafter. You are a true artist. And these darling stamps prove it. Of course being a real cat person I am so drawn to the cat angel. I do hope I win and if not that I can purchase it. I have a little critter called Krabby Kat that I would like to share with you sometime. Am trying to find a way to have it made into a stamp. I would like to do a line of cards called Krabby Kat Kards. You are one talented lady!!!! Love your cat angel. I have been making itsy bitsy roses ever since I looked at your video. Just love them and THANKS so much for your awesome blog. 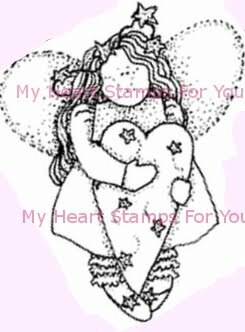 NICE stamps!!!!!!!!!! This is SUCH an awesome giveaway!!!!!! I have a award for you over at my blog. hop over and get it.